Famously home to Robin Hood and his band of Merry Men and situated smack, bang in the middle of England, Nottingham boasts a castle that was built in 1068 and was once home to Sherriff of Nottingham. Once named one of the Top 10 cities to visit in the UK, we have come up with some excellent ghostly reasons why Nottingham is a draw for those seeking out a hauntingly good stay. First stop should be the Galleries of Justice, which claims to be one of the most haunted locations in the country. It began life as a courthouse in 1375, later becoming a prison in 1449. It was the only place in Britain where the accused could be tried, convicted, sentenced and executed in the one place, with many executions occurring at the building’s entrance. Over the years, staff and visitors at the museum, have heard screams, doors slamming and knocks. Visitors to The Bell Inn have reported a ghost (known as Robert) to walk through the restaurant and there are also claims that two ghostly men are seen sitting at one of the tables and then suddenly disappear. The toilets aren’t even out of bounds for reports of paranormal activity, with tales of a female phantom often spotted while the apparition of a jester is said to stand at the front door. The ghosts of a woman in white and two children have been reported at Colwick Woods, the woman believed to be Mary Chaworth Musters whose children were murdered by their father, William Saville, who was hanged for his crime. There have also been reports in the woods of the sound of horses. Once you’ve located your ideal haunted hotel, Nottingham offers a wealth of fantastic museums, monuments and experiences to make your stay one that you’ll never forget. In addition, Nottingham offers wonderful eateries, the most ancient and quirky of pubs – a visit to Nottingham would not be complete within having a drink in Ye Olde Trip To Jerusalem inn which claims to be the oldest in England. It is built into stone caves and is a visit is made complete by its good food and resident ghosts. Easily accessible by major motorways and rail links Nottingham should be on every ghost hunter’s wish list. 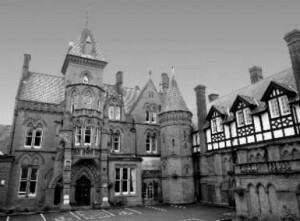 We feature just some of the most haunted hotels in Nottingham. If you know of a haunted hotel in Nottingham that we’ve missed, we’d welcome your suggestion. Just click on the ‘Contact Us’ link in the footer at the bottom of the website.